In a large bowl, combine the flour, sugar and cocoa powder. Stir to combine well. Using your fingertips, rub the cold butter cubes into the flour until the mixture resembles coarse breadcrumbs. Add the cold water and bring the dough together into a rough ball, place on a sheet of cling film and pat into a 1½cm thick disc. Wrap tightly and refrigerate for one hour. On a lightly floured work surface, roll out the dough to a circle around 24cm in diameter. Carefully transfer the dough to a 20cm tart tin, flattening it and trimming off the edges as needed. 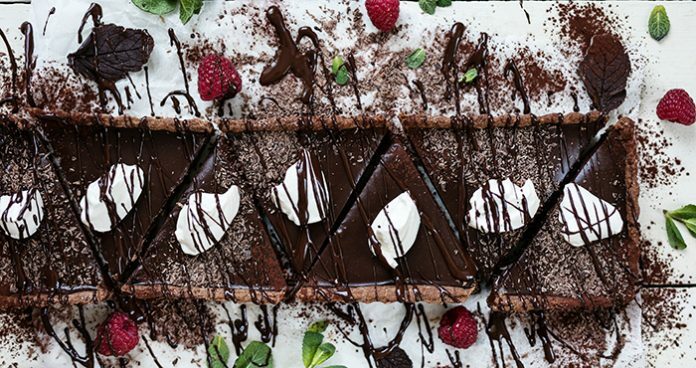 To replicate the rectangular tart here, shape the dough into a log and roll out to fit a 36cm x 13cm rectangular fluted tart tin. Place in the fridge for 15 minutes. Meanwhile, preheat the oven to 180˚C/160˚C fan/gas mark 4. Prick the bottom of the pastry case all over with a fork, then bake for 15-20 minutes until slightly puffed and lightly golden. Set aside and allow to cool completely. In a small saucepan, combine the cream and mint leaves. Bring to a boil over a low heat, then cover with a lid and set aside to infuse for 20 minutes. Place the chocolate into a heatproof bowl. Stir the sugar into the mint-infused cream. Bring to the boil again, then immediately pour through a sieve over the chocolate. Stir until the chocolate has melted and the mixture is thick and glossy. Allow to cool. Pour the cooled ganache into the pastry shell. Smooth the top and place in the fridge for at least one hour to set.